Magenta Health is pleased to welcome Dr. Brent Crawford to the Beach clinic location at 1874 Queen St. East. Brent will start accepting new patients starting mid-March 2019. Brent studied biology and psychology at McMaster University in Hamilton, Ontario, where, he also completed his Master of Science degree, exploring the impact of environmental toxins on reproductive health. Brent completed both his medical degree and his post-graduate training in family medicine at the University of Toronto and St. Michael's Hospital downtown. Afterwards, he accepted an additional fellowship in low-risk obstetrics at North York General Hospital. While Brent enjoys providing comprehensive care to patients of all ages, he has special interests in LGBTQ+ health, care of patients living with HIV, and prenatal/obstetrical care. He welcomes pregnant patients at Magenta Health and is part of a team of physicians that deliver at Michael Garron Hospital/Toronto East Health Network. Magenta Health is pleased to welcome Dr. Sabrina Chung who will be practicing out of our Riverside location starting in January 2019. Sabrina graduated with honours in Psychology at the University of Western Ontario where she also later earned her medical degree. She completed her post-graduate training in family medicine at Mount Sinai Hospital in Toronto. We are pleased to welcome Dr. Sana Mehrani to Magenta Health. She will be practicing out of our Riverside location starting in October 2018. We are pleased to welcome Dr. Dennison Lai to Magenta Health. He will be practicing out of our Riverside location starting in October 2018. We are pleased to welcome Dr. Natasha Chadha to Magenta Health. She will be practicing out of our Beach location starting in September 2018. Natasha earned her medical degree at Boston University in Massachusetts. She completed her residency training in family medicine with The University of Manitoba, in the small rural town of Dauphin. 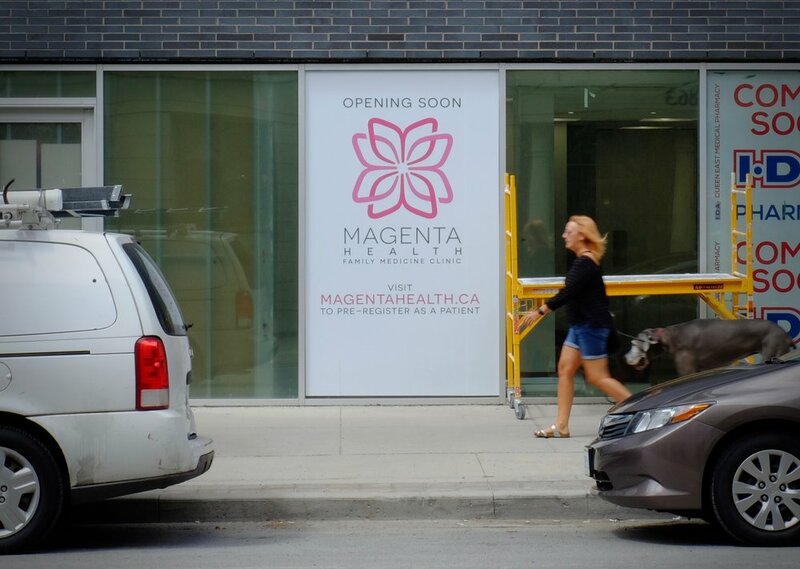 She is thrilled to be moving to her birth city of Toronto to start her own family practice with Magenta Health. Natasha enjoys looking after patients of all ages. The Beaches clinic at 1874 Queen Street East is now open! We are delighted to announce that our long-awaited Beaches location at the intersection of Queen and Woodbine is open at last! We have an additional physician who is joining the team in September - register here. The clinic will grow over time to help ensure after-hours care is conveniently available, as well as ensuring patients have access to medical care during physician leave (e.g. vacations / holidays). To patients that have recently pre-registered with the clinic; thank you for your patience, we will be sending you appointment invitations soon. If you live in the area and are looking for a family physician, click here to register. We are delighted to be joining the Beaches community and look forward to meeting all our new neighbours! Construction is finishing up at our new Beach clinic. Everyone on the team has been pushing hard to propel the project to the finish line. We’re in the home stretch! To patients that have recently pre-registered with the clinic, thank you for your patience. We have an additional physician who is joining the team in September, so we will be sending you appointment invitations soon. Exciting times! 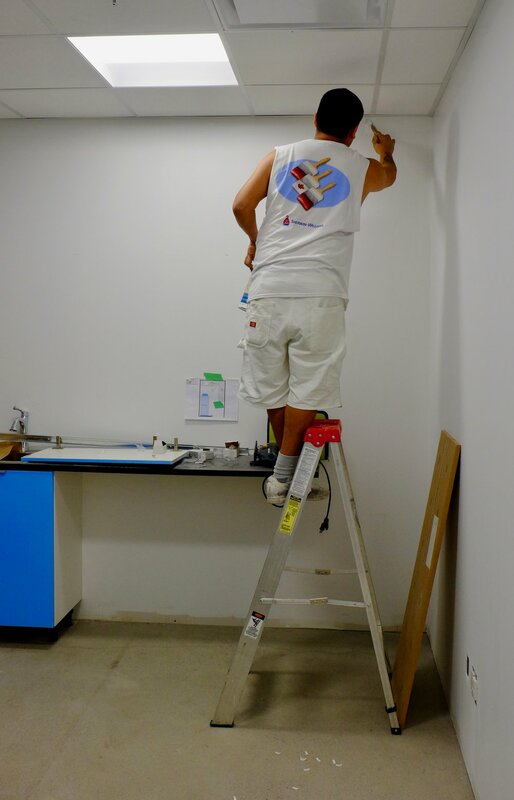 As the construction at our Beaches clinic moves along, all of us at Magenta Health are starting to get the tingles seeing the new clinic take shape. Rooms are framed and drywall is going up. Our temporary signage has been installed to announce our future presence to the Beaches community. We are looking forward to opening our doors in August 2018! We frequently get questions on social media or emailed to us in respect of the status of the Woodbine location. Please feel free to share this update with anyone who might be interested, or any individuals looking for a family doctor. For patients looking for a doctor in the Midtown area, we also have a clinic at 418 Eglinton Ave. West with both male and female physicians accepting new patients. See here for location and here for our physician bios. We are pleased to welcome Dr. Sarah Ward to Magenta Health. Dr. Ward will provide care to all of Dr. Lo's patients while Dr. Lo is on parental leave. Dr. Ward completed her medical training at the University of Western Ontario. She graduated from the University of Ottawa’s family medicine residency program and has additional training in Emergency Medicine. We are pleased to welcome Dr. Heather Sherwin to Magenta Health. She will be practicing out of our Midtown location. Heather studied commerce at Queen’s University where she was a varsity level athlete and Academic All-Canadian. She graduated with honours and worked as a management consultant before returning to school to study medicine at the University of Sydney in Australia. She subsequently completed her post-graduate training in family medicine at the Sunnybrook Health Sciences Centre site of the University of Toronto. We understand that people live busy lives and that’s it’s hard to find time for physical activity. That’s why we like to promote small changes and small adjustments. They are easier to start and have a greater chance of sticking! Over the past week, several of my middle age and elderly patients have requested prescriptions for a Shingles vaccine (Zostavax). There is a lot of marketing (complete with fiery burning barbed wire around a body) about the vaccine so I think it is important to understand the limitations of the vaccine before proceeding. As our number of family doctors has grown, we are expanding our after-hours coverage to provide better access for our patients. Starting February 2015, Magenta Health will be offering additional after-hours appointments on Saturdays from 10:00 AM to 1:00 PM. As with before, these appointment times are for urgent matters only. Learn more about our clinic hours here. More information on how to book an appointment using our online booking tool can be found here. We are pleased to welcome Dr. Matthew Cruickshank to Magenta Health. Matthew studied computer engineering at Queen’s University in Kingston, Ontario, and subsequently earned his medical degree at the University of Western Ontario. His post-graduate training in family medicine was at the Toronto East General Hospital. He has worked at a number of locum positions and walk-in clinics in the East End and is excited about building his own practice. Matthew is currently accepting new patients. Please note that he will likely be moving to our planned second location at Queen and Woodbine Summer 2015 (*Sept 14, 2015 Edit - Now likely early 2016). Until then, all appointments will take place at our current location at Queen and Broadview. If you would like to sign up, please complete this registration form and we will be in touch by email with more information.